This is a scalable context timeline. It contains events related to the event January 17, 2012: FactCheck Disproves Gingrich Claim that Obama Presiding over Largest Rise in Food Stamp Recipients; Other Media Outlets Agree. You can narrow or broaden the context of this timeline by adjusting the zoom level. The lower the scale, the more relevant the items on average will be, while the higher the scale, the less relevant the items, on average, will be. Former House Speaker Newt Gingrich (R-GA) says that because Supreme Court nominee Sonia Sotomayor (see May 26, 2009) is what he calls a “Latina woman racist,” she should immediately withdraw her nomination. Gingrich bases his remark on a 2001 comment by Sotomayor in which she said she “hopes that a wise Latina woman with the richness of her experiences would more often than not reach a better conclusion than a white male who hasn’t lived that life” (see October 26, 2001). Sending a text message on Twitter, Gingrich writes: “Imagine a judicial nominee said, ‘My experience as a white man makes me better than a Latina woman.’ New racism is no better than old racism.” He follows with another message: “White man racist nominee would be forced to withdraw. Latina woman racist should also withdraw.” Republican National Committee (RNC) media chairman Todd Herman quickly “retweets” Gingrich’s message, which usually signifies agreement with the message, but the RNC will refuse to say whether or not it officially endorses Gingrich’s comment. White House press secretary Robert Gibbs replies that Gingrich is probably not the best source of information or guidance on the issue, and warns against excessive rhetoric: “I think it is probably important for any involved in this debate to be exceedingly careful with the way in which they’ve decided to describe different aspects of the impending confirmation. I think we’re satisfied that when the people of America and the people of the Senate get a chance to look at more than just the blog of a former lawmaker that they’ll come to the same conclusion that the president did.” [Think Progress, 5/27/2009; Plum Line, 5/27/2009; Washington Times, 5/28/2009] Orrin Hatch (R-UT), who sits on the Senate Judiciary Committee, refuses to align himself with Gingrich’s characterization. Asked about Gingrich’s remark, Hatch says, “No, I don’t agree with that.” [Think Progress, 5/27/2009] Days later, Gingrich will appear to withdraw the “racist” characterization, although he will go on to accuse Sotomayor of “betray[ing]” the “American system” of law (see June 3, 2009). Newt Gingrich, the former Republican House speaker and an apparent candidate for the presidency in 2012, tells the conservative National Review that President Obama only pretends to be a “normal” American, but in reality is driven by his belief in “Kenyan, anti-colonial behavior.” Gingrich cites a recent article by conservative author Dinesh D’Souza (see September 12, 2010), calling D’Souza’s insight into Obama’s behavior “stunning… [the] most profound insight I have read in the last six years about Barack Obama.… What if [Obama] is so outside our comprehension, that only if you understand Kenyan, anti-colonial behavior, can you begin to piece together [his actions]? That is the most accurate, predictive model for his behavior.… This is a person who is fundamentally out of touch with how the world works, who happened to have played a wonderful con, as a result of which he is now president. I think he worked very hard at being a person who is normal, reasonable, moderate, bipartisan, transparent, accommodating—none of which was true.… In the Alinksy [Saul Alinsky, a liberal community organizer] tradition, he was being the person he needed to be in order to achieve the position he needed to achieve.… He was authentically dishonest.” The progressive media watchdog organization Media Matters calls Gingrich’s comments the latest in a long line of “not-so-subtle race baiting” by right-wing media figures. Gingrich is a frequent guest on Fox News. [Media Matters, 9/12/2010] White House press secretary Robert Gibbs accuses Gingrich of “trying to appeal to the fringe.” In response, Gingrich tells the Daily Caller that his own remarks “seemed to touch some kind of irrational nerve on the left.” [Washington Post, 9/16/2010] Days later, Washington Post columnist Eugene Robinson asks if Gingrich is “just pretending to have lost his mind, or has he actually gone around the bend?” Robinson answers his own question: “His lunacy certainly seems genuine enough. It’s one thing to be a rhetorical bomb-thrower, as Gingrich has long fancied himself, and another to lob damp squibs of pure nonsense into the fray. The man’s contributions to the public discourse have become increasingly unhinged.” Robinson calls Gingrich’s assertions about Obama’s supposed “Kenyan, anti-colonial behavior” “bizarre.” If Gingrich is indeed rational, Robinson continues, then he is probably attempting to promote the “birther” conspiracy theory that Obama is not a US citizen, but instead “foreign, exotic, alien, somehow not American.” Moreover, Gingrich is trying to promote a much larger conspiracy theory: “that American democracy—indeed, the whole Anglo-American-Judeo-Christian enterprise—is under attack in a titanic clash of civilizations. In this view, we are threatened most acutely by the Islamic civilization. But we must also be on guard against the ‘Sinic’ civilization of China, the ‘Hindu’ civilization of India, and assorted others. This analysis was developed by Samuel P. Huntington, a Harvard professor who died in 2008—and who said he never intended his work to be read as a battle plan. Gingrich seems to believe that our culture and values are also threatened from within—by black and brown people who demand that they, too, be given a voice in defining that culture and those values.” [Washington Post, 9/14/2010] Post media observer Howard Kurtz observes on Twitter that he is “amazed that Newt Gingrich said Obama has a Kenyan view of politics. Not exactly subtle.” [Media Matters, 9/13/2010] Many conservatives have long accused Obama of being un-American because of his Kenyan ancestry (see February 25, 2008, August 1, 2008 and After, October 8-10, 2008, June 29, 2009, and August 11, 2009). Newt Gingrich during a recent debate among Republican presidential candidates. [Source: Associated Press]Former House Speaker Newt Gingrich (R-GA), a Republican candidate for the 2012 presidential nomination, says that schools should save educational expenses by firing all custodians except for one “master janitor” and have the children do the rest of the maintenance work for their schools. Gingrich recommends this particularly for schools in poorer areas. Juan Williams (left) and Newt Gingrich during the Republican presidential debate. [Source: Texas GOP Vote]Fox News commentator Juan Williams, an African-American, takes umbrage with recent comments by presidential candidate Newt Gingrich (R-GA) that he says had unacceptably racial overtones. Williams, moderating a Republican presidential debate in South Carolina with Gingrich and other candidates for Fox News, asks: “Speaker Gingrich, you recently said black Americans should demand jobs, not food stamps (see November 30 - December 2, 2011 and January 5, 2012). You also said poor kids lack a strong work ethic and proposed having them work as janitors in their schools (see November 18, 2011 and After and December 1-2, 2011). Can’t you see that this is viewed, at a minimum, as insulting to all Americans, but particularly to black Americans?” Gingrich responds, “No, I don’t see that.” Gingrich reiterates his call for poor students to earn money by doing janitorial work around their schools, saying that they would earn money, “which is a good thing if you’re poor. Only the elites despise earning money.” Williams presses Gingrich, asking him if his comments, including his reference to Obama as a “food stamp president,” don’t belittle the poor and racial minorities: “My Twitter has been inundated with people of all races asking if your comments are not intended to belittle the poor,” he says. Gingrich retorts: “The fact is more people have been put on food stamps by Barack Obama than any president in American history.… I believe every American of every background has been endowed by their Creator with the right to pursue happiness, and if that makes liberals unhappy, I’m going to continue to find ways to help poor people learn how to get a job, learn how to get a better job, and learn someday to own the job.” The debate audience, described by Think Progress’s Ian Millhiser as “largely white [and] Republican,” cheers Gingrich’s remarks and boos Williams. [Fox News, 1/16/2012; Mediaite, 1/16/2012; Think Progress, 1/17/2012] Williams later says that he believes Gingrich is “pandering” to conservative and presumably racist voters in the audience (see January 18, 2012). Conservative commentator Rush Limbaugh will accuse Williams, not Gingrich, of appealing to racism in his question. “[T]his line of questioning was all racially tinted from Juan Williams,” Limbaugh will say. “Newt Gingrich did not take the bait and answer in a racial context. He answered within the context that we’re all people and that we, as conservatives, want the best for everybody.… [W]e are for everybody doing well, that we conservatives do not see black and white, male, female, gay, straight when we look at people down the line. We see potential. We want the best for everybody. We know what’s holding ‘em back, and that’s government, government central planners, people like Barack Obama, [House Minority Leader Nancy] Pelosi, [Senate Majority Leader Harry] Reid, who look at people and see them with contempt and condescension, see them being incapable, and they treat them that way and they devise systems to deal with them that way, and they keep them forever dependent, which destroys their humanity, which makes us sick. It breaks our hearts.” [Rush Limbaugh, 1/17/2012] Limbaugh later claims that Williams would not have a job if not for “the white guy, conservative who runs Fox News.” [Media Matters, 1/31/2012] Millhiser reiterates the facts that “[t]he overwhelming majority of African-Americans are not on food stamps” and “the majority of [Americans] who receive food stamps are white.” He writes: “It’s deeply disturbing that a man who claims he should be president of the United States cannot understand why his remarks are offensive.… Gingrich’s suggestion that food stamps are somehow a preeminent black issue flies in the face of reality. Worse, it lumps all African-Americans together as federal aid recipients when the overwhelming majority of working-age black men and women are self-supporting taxpayers. Thousands of them are professionals such as doctors or lawyers. One of them is the president of the United States.” [Think Progress, 1/17/2012] Gingrich has a history of making racially questionable remarks and characterizations (see May 27, 2009, June 7, 2009, August 16, 2010, September 12, 2010 and After and December 13, 2011). His claim that Obama has presided over more Americans receiving food stamps than ever before is wrong (see January 17, 2012). And a recent study by the nonpartisan Center on Budget and Policy Priorities found SNAP to be an extraordinarily effective program in helping Americans survive the effects of the recession (see January 9, 2012). The nonpartisan FactCheck.org finds that recent claims by presidential candidate Newt Gingrich (R-GA) that “more people have been put on food stamps by Barack Obama than any president in American history” are wrong. In fact, far more Americans were added to the Supplemental Nutrition Assistance Program (SNAP) rolls under President George W. Bush than under Obama. 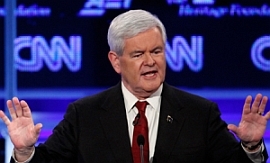 Gingrich has made the claim in a number of political speeches (see November 30 - December 2, 2011 and January 5, 2012), but his reiteration of the claim during a recent Republican debate in South Carolina has drawn a great deal of media attention (see January 16, 2012). FactCheck finds: “Gingrich would have been correct to say the number now on food aid is historically high. The number stood at 46,224,722 persons as of October, the most recent month on record. And it’s also true that the number has risen sharply since Obama took office. But Gingrich goes too far to say Obama has put more on the rolls than other presidents.” Information from the US Department of Agriculture (USDA)‘s Food and Nutrition Service going back to January 2001 “show[s] that under President George W. Bush the number of recipients rose by nearly 14.7 million. Nothing before comes close to that.” Moreover, “the program has so far grown by 444,574 fewer recipients during Obama’s time in office than during Bush’s.” The trend in recent months has been for the number of food-stamp recipients to decline, another fact Gingrich fails to note. FactCheck finds that the rise in the number of Americans on food stamps—currently one out of seven—began during the second term of the Bush presidency. “In the 12 months before Obama was sworn in, 4.4 million were added to the rolls, triple the 1.4 million added in 2007,” the organization writes. “To be sure, Obama is responsible for some portion of the increase since then. The stimulus bill he signed in 2009 increased benefit levels, making the program more attractive. A family of four saw an increase of $80 per month, for example.… The stimulus also made more people eligible. Able-bodied jobless adults without dependents could get benefits for longer than three months.” Part of the reason for the higher number of recipients under Obama is the new outreach to eligible citizens by state governments, according to the USDA; many state governments have worked harder to inform eligible citizens of their right to apply for government assistance, and have reduced the amount of information that claimants must provide to receive assistance. FactCheck concludes: “We don’t argue that the program is either too large (as Gingrich does) or too small. It has certainly reached a historically high level, and may or may not grow even larger in the months to come. But the plain fact is that the growth started long before Obama took office, and participation grew more under Bush.” And it quotes the USDA’s Kevin Concannon, who recently told a Wall Street Journal reporter, “I realize Mr. Gingrich is a historian, but I’m not sure he’d get very high marks on that paper.” [USA Today, 1/17/2012] CBS News notes that the White House has called Gingrich’s claims “crazy,” and finds: “While the number of people on food stamps is indeed at a record level, that’s in part because of eligibility rules being relaxed under the administration of George W. Bush. It’s also due in part to the economic downturn that began under Mr. Bush.… [T]hat percentage increase hardly makes Obama the ‘best food stamp president in American history,’ at least when you look at the question proportionally. The percent increase in beneficiaries during Mr. Bush’s presidency was higher than it has been under Mr. Obama: The number of beneficiaries went from 17.3 million in 2001 to 28.2 million in 2008—an increase of 63 percent in years that are mostly considered non-recessionary.” [CBS News, 1/17/2012] US News and World Report agrees with FactCheck, finding that “SNAP participation has been on the rise since well before President Obama took office. Nearly 17.2 million people in FY 2000 participated in the program, a figure that increased by nearly 64 percent by 2008.” [US News and World Report, 1/17/2012] The Associated Press accuses Gingrich of distorting the facts and notes: “It’s gotten easier to qualify for food stamps in the past decade but that is because of measures taken before Obama became president. It’s true that the number of people on food stamps is now at a record level. That’s due mainly to the ailing economy, which Republicans blame on Obama, as well as rising food costs. The worst downturn since the Great Depression wiped out 8.7 million jobs, pushed the unemployment rate to a peak of 10 percent in October 2009, and increased poverty.” [Associated Press, 1/17/2012] The nonpartisan Center on Budget and Policy Priorities has found that SNAP is a critical element in keeping poverty-stricken Americans, particularly children and the elderly, from starving during the economic recession (see January 9, 2012).